The use of Optical Drives is certainly reduced as USB storage devices have taken their place offering additional benefits. Seriously, I too use my DVD Drive for Formatting and re-installing so, here’s an easiest way to install any version of Windows (XP, Vista, Windows 7, 2003, 2008) using Bootable USB stick or Pen Drive. Until few years ago, such an operation required the use of the command prompt and it was quite complex. Fortunately, the open source community is always ready to offer solutions that simplify life for Windows users and it is one of those fans who have made freely available software that can prepare us for the USB Drive in few steps. Before starting, it is assumed that you have inserted Windows DVD in Optical Drive or mounted Virtual DVD Image. 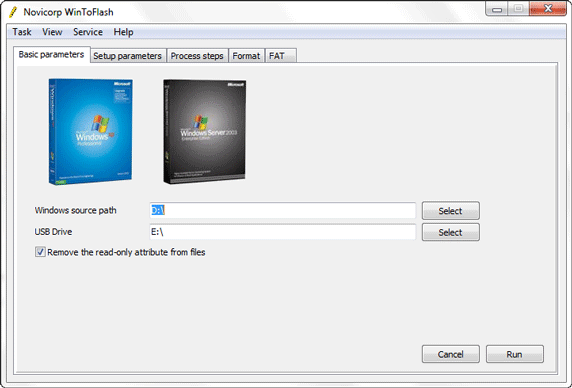 WinToFlash doesn’t require installation, Download the ZIP file and extract it. Execute WinToFlash.exe and go to Andvanced Mode tab. After selecting the task you want to perform, In Windows Path, Browse the Path of Drive where Windows CD / DVD is located. It is generally the emulated drive or the real drive where DVD is inserted. Set the Path of USB where Pendrive is inserted and Press “Run” Button. Here, Windows may warn you about Formatting USB stick so, continue with it and at the end of process, you will have Bootable USB stick of Windows. Now, Enter BIOS and set First Bootable device as USB to start installing Windows which is exactly similar to how you did it using DVD. This trick use but when i run then the error message show invlid path. If I partitioned it to the size of each windows ISO file, respectably, would it be possible to install any version of windows I liked from the boot menu prompt? Or am I stuck with the first partitioned space? I repair computers for a living, so this would make life AWESOME if it were possible. Just curious.